GET IN. 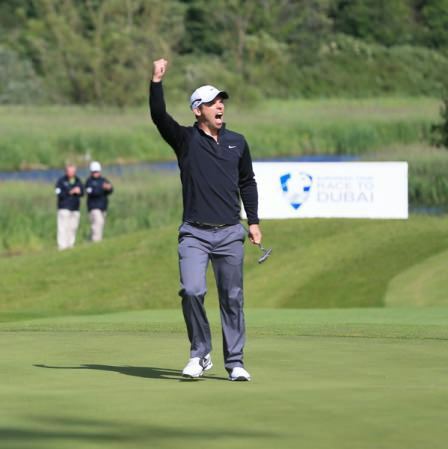 Irish Open champion Paul Casey celebrates his tournamernt winning eagle putt on the 18th at Carton House. 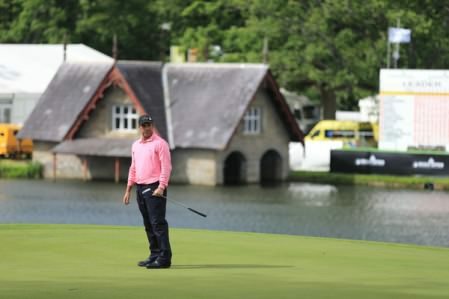 Picture: Fran Caffrey / www.golffile.ieIt was the most English of distances - a couple of paces less than a cricket pitch - yet for Paul Casey the 20 yard walk to pull the ball out of the hole on the 18th green on the Montgomerie Course was the most pleasant of journeys. A spectacular eagle three from 60 feet gave the 35-year old Englishman the 12th European Tour title of his career, allowing him to come from four strokes behind overnight leader Joost Luiten to win by three from the Dutchman and England’s Robert Rock on 14 under par thanks to a closing, five under par 67. Ranked 169th in the world from a career high of third in 2009, Casey is now back in to the world’s top 100 having endured enough bad luck and heartache over the past four years to last most people a lifetime. Not only did develop a bad case of turf toe that still leaves him in considerable pain, he broke his collarbone snowboarding just 18 months ago and has also been through a painful divorce. Little wonder that he has fallen off the face of the planet since he won the Volvo Golf Champions in Bahrain in January 2011. With his coach Peter Kostis currently undergoing chemotherapy for colon cancer, it was an emotional win for the former Ryder Cup player, who is now determined to become a contender for majors again following that inspiring victory by countryman Justin Rose in the US Open two weeks ago. Paul Casey with Conor and Lee Mallaghan of Carton House. Picture: Fran Caffrey / www.golffile.ie“I said to somebody this week, when you’re playing great golf, you have no idea how you ever played bad golf,” Casey said after pocketing a cheque for €333,330 as well as guaranteed starts in come big events such as the HSBC Champions, the Bridgestone Invitational and the US PGA. “And when you play bad golf, you’ve got no clue how you ever played good golf. “I’m looking at some of my mates hitting great golf shots, and I’m thinking to myself, I can’t see myself doing that right now, and I don’t have the confidence to do that, and that eats you. That really hurts. It’s quite a painful place to be…. 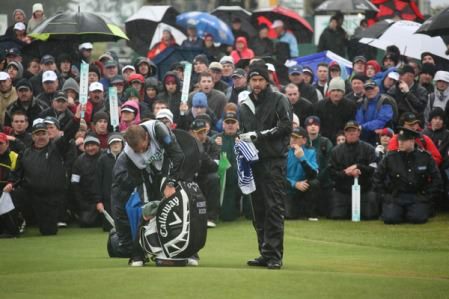 Second to Thomas Bjorn when the Irish Open was last played at the Montgomerie Course in 2006, Casey loved the lack of rough this year which gave him the freedom to open his shoulders with the driver and make five birdies in a six-hole stretch in the midst of rain squall to pull clear of the field. José María Olazábal putts out on the 18th at Carton House, where he finish joint fifth. Picture: Fran Caffrey / www.golffile.ieWith 1990 champion José María Olazábal making four birdies in the first 10 holes to draw level at the top with Luiten on 12 under par, it looked as though the Irish Open would get a major championship calibre winner after all following the early exit of Ireland’s Big Four on Friday. But the veteran Spaniard’s wayward driving caught up with him as the faded to a 72 and joint fifth. Instead it was Casey, playing in the penultimate group with 2009 runner up Rock, who stamped on the accelerator as the rest braced themselves for the airbag. After a birdie at the par-five eighth (two feet), he reeled off five successive threes, picking up shots at the ninth (8ft), 10th (12ft), 11th (12ft) and 13th (tap-in) find himself three strokes clear with three holes to go. Bogeys at the 15th and 16th put his victory in doubt momentarily but he banished all his demons when he hit a three-iron 200 yards to the front of the 18th green and then drained the putt. Finger the trophy bearing the names of majors winners Olazábal, Pádraig Harrington, Bernhard Langer, Seve Ballesteros, Michael Campbell, Ben Crenshaw, Nick Faldo and Ian Woosnam, Casey said: “I don’t think I quite realised the list of names who have won The Irish Open until I was presented this a little bit earlier. 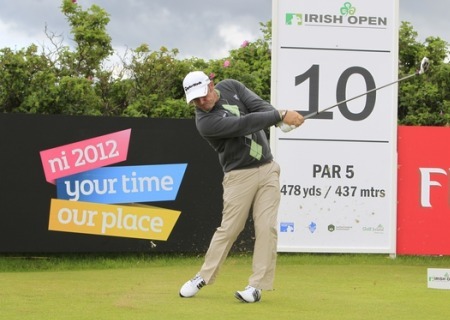 Rock birdied the last two holes for a 71 to finish tied for second with Luiten (74) on 11 under and take home €173,710. That was considerably less than the €500,000 he got at Baltray in 2009, when Shane Lowry could not accept the winner’s cheque. The Irish Open has since battled on without a sponsor but Casey promised to do his bit to put the tournament back on the map. “Judging by last year’s turnout, which was off the charts; this year’s turnout has been phenomenal,” Casey said. “Even with obviously the Irish players not being up at the top of the leaderboard, it’s still been I think a massive success this week. “So I love it. I think we need an Irish Open. This is a National Championship. It has the history. It has the great golfers turning up. It has my support. I’m going to be back for years to come. Now that I’ve got my name on this trophy, I’m not going to miss one of these. Jose Maria Olazábal, Irish Open champion at Portmarnock in 1990, will be at Royal Portrush later this month. Picture ©Getty Images José Maria Olazábal will finally fulfil a mission that has taken an entire golfing career to complete when he tees up in the Irish Open, which is close to a sell-out at Royal Portrush Golf Club later this month, writes the European Tour.